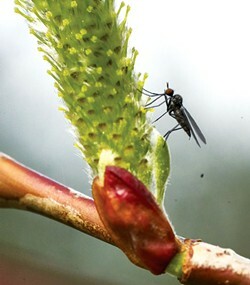 A black fly pollinating on the same plant. It was sunny when I went to get my hiking boots but by the time I got dressed and out the door, it was 49 degrees and drizzling. I went anyway. The path down to the river was dark, the only sounds were the gentle pok, pok of water dripping from branches. The burning in my fingertips told me it was too cold for insects to be servicing the barely open Indian plum flowers. Down on the flood scrubbed river bar were scant traces of life. Near the end of the trail, out in the open, something buzzed furiously around me three or four times then headed off. From the quick glimpse I got I knew it was a bumblebee. It headed for a big pussywillow about 50 meters upstream. Against the subdued damp earth tones of the riverbank, dark overcast sky and somber evergreens, the yellow green of their catkins stood in sharp contrast, beckoning nectar and pollen feeders. It was busy despite the cold. Insects were there in numbers. I started taking pictures and realized except for a couple of tiny bees they were all flies of one sort or another. Members of the order Diptera are unique among the orders of insects in having only two wings instead of four. In my opinion it is the most diverse order. They fill the same niches as most of the other orders from parasites and hunters to, in this case, nectar feeders, which provide pollination services to a great many flowering plants. My college entomology professor did his thesis on pollinators of the wildflower Clarkia. To everyone's surprise, the majority of insects to visit the flowers he monitored were various species of flies. It may be true for willows as well. American poet Karl Shapiro begins his poem "The Fly" with the address, "O hideous little bat, the size of snot." No other group of animals is as reviled as flies. Annually, members of the order Diptera account for millions of human deaths through diseases they spread. The ones that pester, infect and disgust us are really only a small percentage of the 160,000 known species, which is only a small fraction of the estimated 1 million species, the majority of which are unobtrusive and unknown to us. There seems to be a fly tailored to feed on anything organic, living or dead. The other day, taking photos of fetid adder's tongue flowers (Scoliopus bigelovii), I got one shot with three insects in it. Even bugs photobomb us. 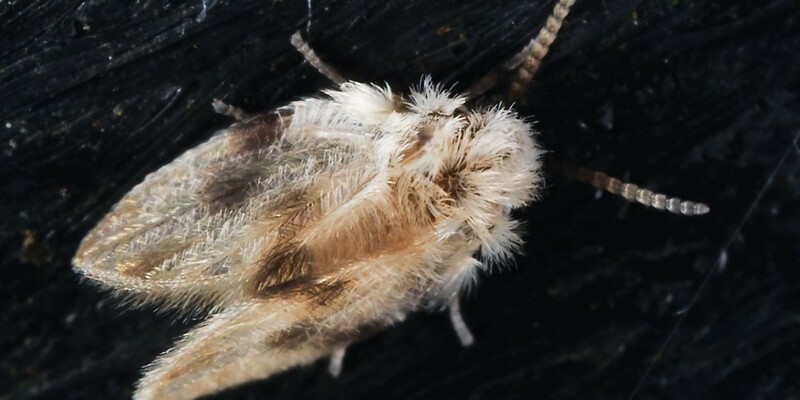 Drawn by the flower's dank odor, there was a fungus gnat, a moth fly and a tiny wasp (order Hymenoptera). From the look of it, the wasp may have been trying to prey on the gnat. So much of what goes on at this scale is unknown to us. 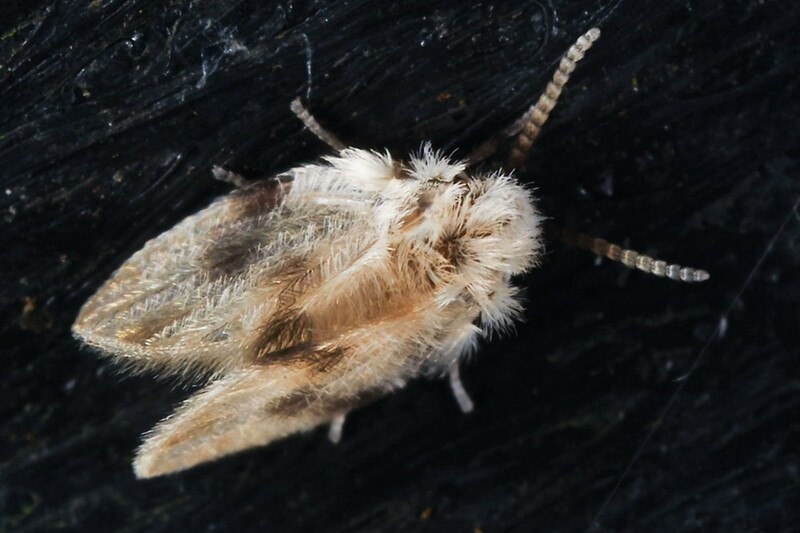 At 2 to 3 millimeters, moth flies look like tiny moths but are truly flies, also known as drain flies and sewer flies. While harmless, they are considered pests when they infest our homes. Some fungus gnats are small and vaguely resemble mosquitoes, but feed on — you guessed it — fungus. Others, like the tiny, glistening black Bradysia, emerge from soil in potted plants to become household pests. While researching them I was continually referred to the book Flies by Stephan A. Marshall so, despite its heft (5 pounds 5.5 ounces) and hefty price tag ($88), I ordered a copy. It is a truly great book and a new favorite among my collection of entomological works.